Laserfiche automates processes, manages content and integrates applications across the organization. It works easily within your existing infrastructure by bringing your applications together and simplifying how work gets done. 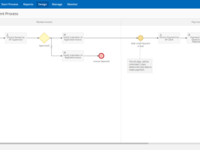 With Laserfiches code-free process designer, you can keep things moving quickly between departmentswithout programming experience. Plus, our document management features digitize and organize business-critical information. Pros: Perfect for document retention, long term digital storage, and business process routing. It's fairly easy to use, but at times does require some training. The available applications provide us with almost limitless capabilities when it comes to our business and HR processing. I have yet to find something I am unable to build that has been requested by our district staff. Cons: To be able to fully use the software applications capabilities one would require a fair amount of experience with other applications such as SQL database design, and Windows Domain administration. I would say its not truly possible to utilize Laserfiche to its fullest without personal knowledge of the before mentioned items or a team of individuals that has the knowledge necessary. Overall: We have been using Laserfiche products for approximately 8 years. Our original purpose was to digitize our HR records, and the scanning utilities provided us with just the right solution to get this accomplished with very little stress. Once Laserfiche Forms was released we adopted it and slowly started to push our HR and business processes online. After a year the potential of this product was realized, and we now have approximately 85% of all our HR and Business department related processes online through Laserfiche. Pros: The end to end process from collection to destroy / retain and that it has the ability to keep the entire process electronic. I like that they are focusing on a cloud solution that makes the application reachable to businesses of all sizes. The continued research and development along with the support make it a product that changes and supports with the times. Cons: The cloud needs storage in Canada, ability to apply sequential numbers to documents that would act like a register. You can do this with code and sql tables but it would be great to be able to do it within the form without the requirement of a developer. Pros: The ability to pull documents where ever we are... in the office, at home or even out of the country. Our clients appreciate us having the information handy in a timely manner. It does also help keep us organized. Cons: There are a lot of features to using it, therefore new staff have a long learning curve. Overall: We've been using Laserfiche since 2006 and have drastically cut down on our lease space because we no longer have the need for filing cabinets. Being able to access client info via our web portal is huge for us. Pros: Laserfiche is the easiest records management system I've ever used. It is quick and easy, it allows to set up your documents in a format to match your filing system. The documents are researchable and can be emailed in a variety of formats. Cons: The initial set up is kind of pricey. Also, if you (the user) does not put in the information correctly it makes it hard to search those particular documents, but that is training issues on our end. Pros: We got Laserfiche 4 or so years ago to help cut down the amount of items we had in our servers at work. 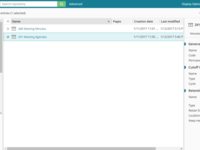 With Laserfiche, we were able to have items put into different group types, have metadata associated with each page, set retention periods for how long we have to keep the document, and have access across the whole City. Multiple people in different offices and buildings can add and view files as needed. We also got this product because we can store even more on here with the option of having it saved as a .tif image instead of a .pdf or .jpg that takes up more storage spage. Cons: First starting out on the program was definitely a learning curve for everyone. It is not really user friendly, but it does get easier to do. I am currently having a hard time trying to convert my .pdf files into .tif files once they are in the Laserfiche program. I have no issues scanning it in to be a .tif document, but some of my stuff that needs to be added to Laserfiche are already created .pdf files that I do not need to print just to re-scan in. Pros: Excellent digital file cabinet, easy to get documents into a neatly organized drive. Cons: I am not exactly sure how the metadata features are supposed to work but I have trouble doing a search to locate documents where I thought based on the information I put in metadata fields, I would easily locate what I am searching for. I will continue to explore this feature. Laserfiche is a very solid product for document storage. Lots of capability. Pros: Highly configurable suite of products. Plenty of support in the community. The company updates and improves the software annually. Very strong user conference each year. Cons: Some modules are costly and depending on the size of your organization, price my preclude some of the capability. Easy processes that are user-friendly from function to function. Pros: I really like the ability to transition the configuration of sending the documents to their destination from manual to immediate. Cons: I have had troubles with inserting a document in the finished file in the destination folder. It will not allow me to scan from there and add more pages. Overall: It helps with our record keeping by efficiently channeling it to the proper digital folders. Pros: I like the convenience of Laserfiche. It is easy to use. Cons: There is not much I don't like about the software. It is pretty straight forward. Pros: This software provides a friendly interface to our users and helpful workflows while providing a centralized location with protections in place to keep data safe. Cons: There is some work on the back end to set up this software, but in the end it is well worth the effort. Overall: It has been a wonderful experience with Laserfiche, over storing our information on network shared drives. It has helped us with finding information within documents easily and quickly. Pros: As an end user, Laserfiche is great for document management. 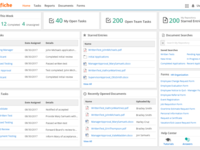 It has helped automate many of our manual processes through custom workflows. Template help keep everything organized by standardizing meta data, which makes searching and sorting super easy. Cons: There are a lot of options. It can take a little bit to get everything setup so it all works and so all the different document types can be displayed properly. Pros: Easy to scan things to Laserfiche. You can give the file a name, and make it as detailed as possible so if you ever need to retrieve the scan later, you can get exactly what you are looking for instead of searching through tons of other files. Cons: If you do not enter enough information about the Scan, it can be pretty hard to find it later on. Sometimes there are duplicates also. Pros: Scanning capabilities and document/records management system is very easy to use and helpful filing capabilities. Cons: Sometimes the software can be slow depending how many users are using it simultaneously. It doesn't happen often, but on occasion it has happened where it seems to take longer to scan documents or open scanned documents for viewing. If your looking to get away from hard copy file storage this is the way to go!! Pros: Love how easy it is to scan a document label it and put into a specific folder that can easily be found and never have to worry about where it is or have to sift through hard copy files anymore. Cons: Nothing maybe a more of a how to use instructional video on the various features of use. Pros: When working in a highly regulated industry, document management is key. Laserfiche is the easy way to manage several hundred documents. Overall: Laserfiche is essential for regulated companies looking to keep customer's information in order and secure. Pros: The solution has lots of great features that make it very powerful and provide lots of scanning solutions for the organization. Cons: The cost per user can be prohibitive to organizations. Expanded features can require dedicated staff to manage all the option sets interactivity. Comments: We're admittedly still new users, and so far we like it, but it's far more programmer intensive than we were led to believe. We have to have help to do almost anything. That said, it will be worth it to streamline some of our processes. Pros: Establish stored procedures and databases which automatically integrate and run processes for you. We've been able to take a six week project and move it down to about 4 days. Cons: Hard to learn to use and set up, we often need to pay programmer time; which gets expensive. Program won't fax out things on its own--we've had to implement an external procedure. Overall: I used the software and i have found it very useful. Lasefiche has basically, mastered the art of providing solutions to their clients. Pros: This software will basically do anything you need it to for document management and more. Cons: The software is way to complicated to build for the average person. Overall: I've had Laserfiche for 2 years now, and I'm still struggling to get it fully operational. "Run Smarter" - More than just a tagline! Comments: We have been using Laserfiche for almost five years, and we continue find areas where our agency (Law Enforcement) can put it to good use. For the end user, Laserfiche is very simple to use, with our typical user up and running in about twenty minutes. The solution is completely customizable to the extent that you want it to be, or you can use it right "out of the box". With the addition of Forms, QuickFields, and Workflow, Laserfiche is a solution that continues to grow with us and consistently eliminates a lot of time-consuming processes through automation, ultimately having a positive impact on officer safety and the public we serve. I've never worked with a software company that is as engaged with their customers--and provides amazing support year-round (to say nothing of a stellar annual conference)--as is Laserfiche. We truly have been able to "Run Smarter". Comments: Finding Laserfiche some years ago was a God-Send for me and my company. 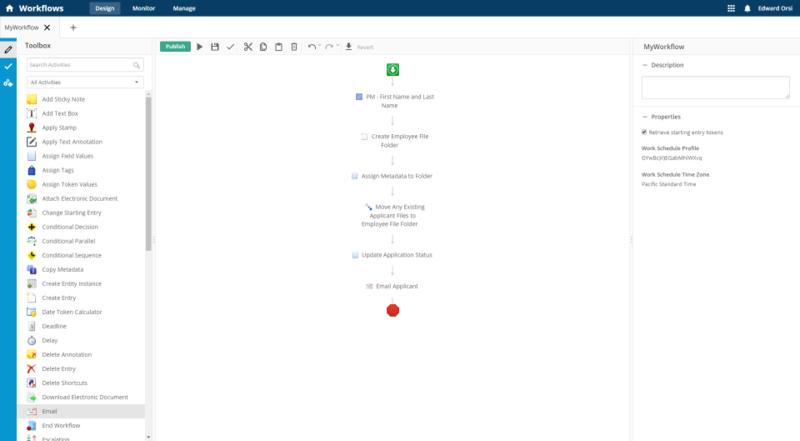 I wanted to go paperless and thought I had exhausted affordable market-place offerings, yet decided to take one more chance and look at Laserfiche. At first, I was overwhelmed. I thought I had to learn everything, install everything and use everything. However, I found that I only needed to buy what I needed and expand as needed. Laserfiche has exceeded my expectations at every level. From concept to utility, I could not be happier about continuing to do business with Laserfiche. Some of my friends believed other companies had better offerings right up until they examined Laserfiche in total. Anyone looking for a document imaging system that creates simple, elegant document management solutions that help organizations run smarter should invite Laserfiche in for a visit. Pros: Ease of use. Much easier to find / search files than going through physical files. Cons: Hasn't eliminated paper copies (yet) for our organization. This is a great repository too. However, it would be much better if it linked to Windows Explorer. Pros: The drag and drop capabilities are extremely helpful. Also, the search options based on meta data makes locating documents much easier. Cons: The system lags and has issues importing large or multiple documents. The speed of the system and overall ease of use could use improvement. Comments: When I started looking at document management systems to get our records management problems under control, Laserfiche had the easiest, most user-friendly system I could find to implement. 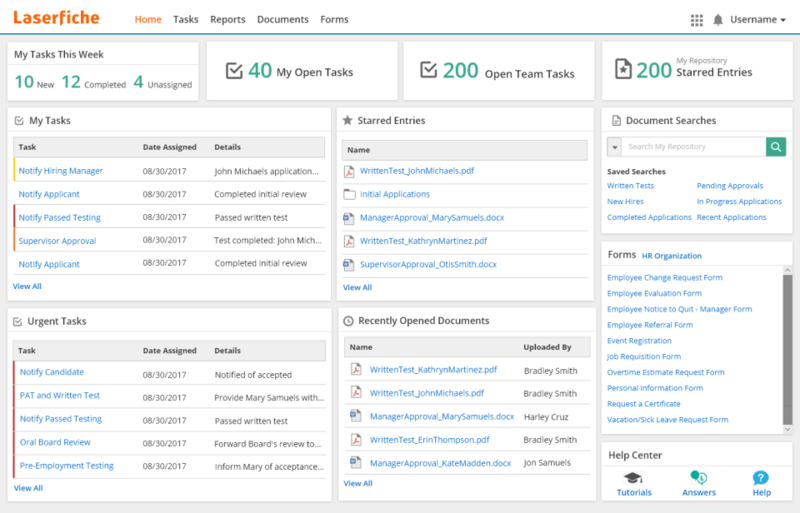 With little IT support and awesome Laserfiche support, I was able to get Laserfiche, Records Management Edition, up and running, helping our organization with records management and compliance issues. 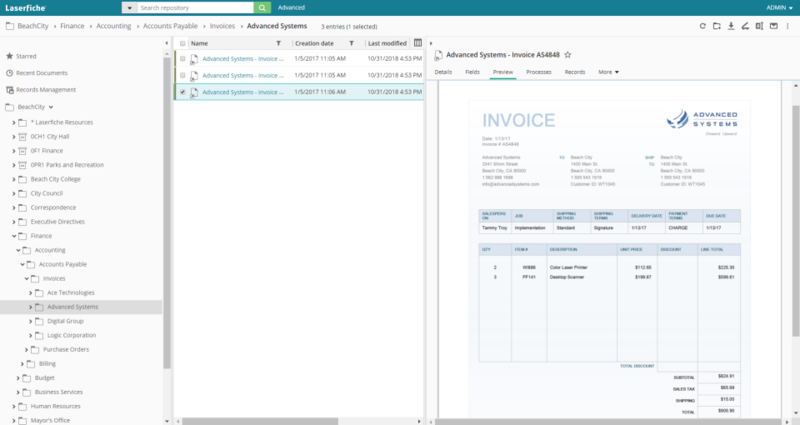 Laserfiche continues to expand its functionality and is a robust system and deserves a deeper look for anyone comparing systems. Pros: We are able to set up workflows to capture our documents in an orderly fashion, which has allowed us to do away with more manual processes. Cons: The initial setup process can be a bit strenuous, but the end product is worth it if the time and effort is put in initially. 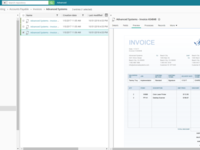 Overall: Automate manual process in document management. Comments: The flexibility, ease of use, familiar windows explorer type interface, and strong workflow tools allows Laserfiche to excel in any vertical market. We have installations in Manufacturing, Financial, Medical, Insurance, and Government. These installations range from 2 users to above 75 users with varying software skill levels from novice to expert and all of the users are able to hit the ground running with minimal training. Doing ediscovery from Laserfiche and it is a terrible products. Cons: It does not support big documents. It gives error constantly while editing and logs you off. It is a terrible product for e discovery. The only function We need is to be able to see the documents. In lasefiche if the pdf is 100 page long good luck with that. Comments: I work for an organization that uses Laserfiche daily. I find it intuitive and easy to use for both scanning documents and recalling them later. 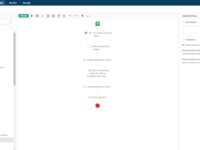 The ability to connect with existing software to create workflows is an ongoing process that makes pen and paper tasks much more digital and streamlined. Pros: Work flow and transfer to the appropriate departments. Being able to create workflows. OCR and its capability to scan documents. Cons: Not having the capacity to work with our existing software (ie: Spectra); would be ideal if we didn't have to export and create a .csv file so this data can be integrated to our software. Comments: I have been using Laserfiche ECM for over 15 years. It was a great product back then, but Laserfiche did not rest on their laurels. Year after year they continue to improve their product and support. I highly recommend Laserfiche ECM. Pros: It helps in the managing of document and it provides solutions to the problems . Cons: i don't think so . Overall: It was a excellent software and after using it became useful to me and my company. This software is very important for a company to manage their documents or records . Comments: My experience after using this software was very good because it contains useful aspects and better guide lines !